A home isn’t just a dwelling but it is also a place where we could express our likes, hobbies and interests. First glance to our space will deliver a message about our personality into the guests. We know for a fact that we don’t just get anything for the home. Whatever is inside it, is something we love and something that shows who we really are. So, today we will show you a home that reflects the character and interest of the owner who happens to be an art collector. Upon knowing that this apartment is occupied by an art collector, you would guess that it has many beautiful art works inside it. And yes, you are right. 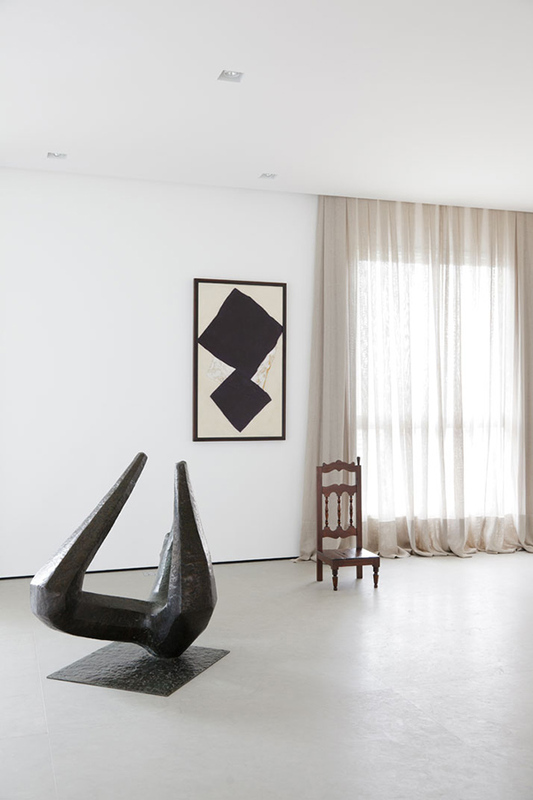 And so this apartment in São Paulo, Brazil is a home to some exquisite art. 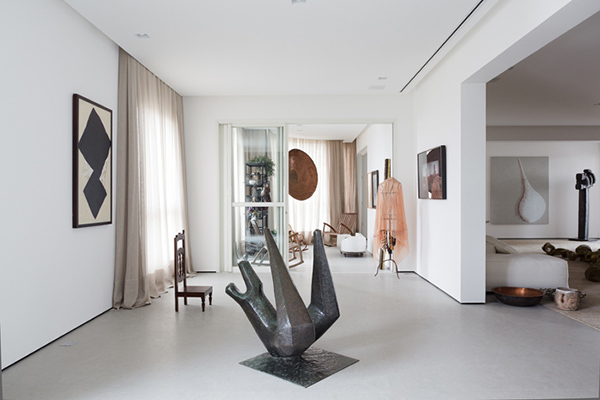 It perfectly blended the functions of a home as well as exhibiting awesome art work collections. But aside from that, there are other interesting features of the Art Collector’s Apartment. 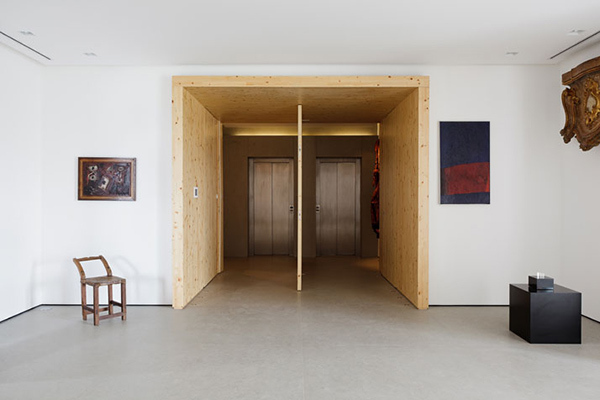 The primary living space has fresh white walls that are adorned by paintings and sculptures that enhance the gallery concept. Now take a look at this door. It opens upon its central axis, not an ordinary door indeed! 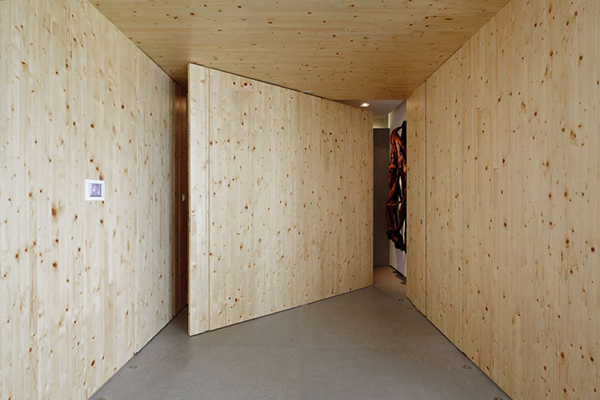 The entrance used a Finnish Pinus wooden door. Pretty interesting, right? Blue limestone floors are used in the interior that resemble a typical gallery industrial floor. Look at this table full of artistic stuff! 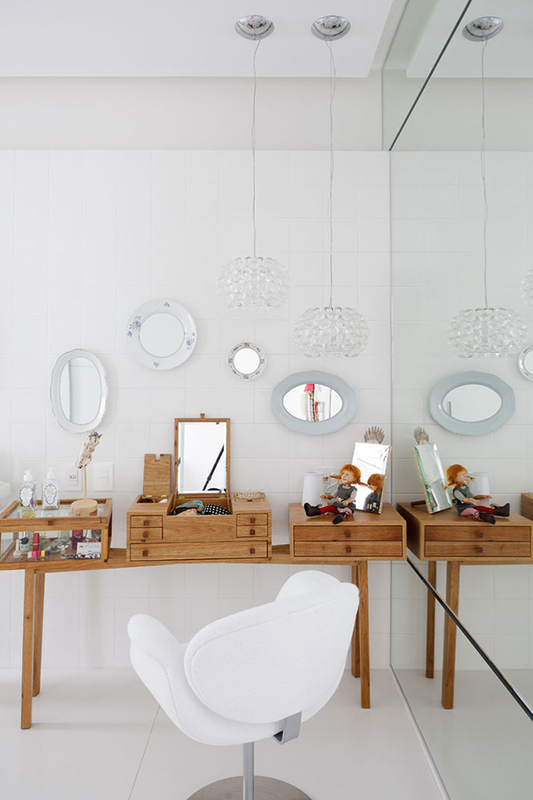 And different mirrors are on the wall too! I like how the wooden table looks with the white backdrop. Look at the artistic elements in the apartment from the sculpture to the chair! This stone sculpture is one highlight in the apartment. Take a closer look at the bookcases. It pivots to open and close and reveal the space behind it. When close, it looks like nothing is behind the bookcases. A secret room indeed! A pretty dining room white white furniture. Even the centerpiece looks very artistic as well as the chairs with wooden legs too. To showcase the area rugs, they were laid over each other. There are also pretty jars in the bedroom as well as a wall art that relays a strong message. 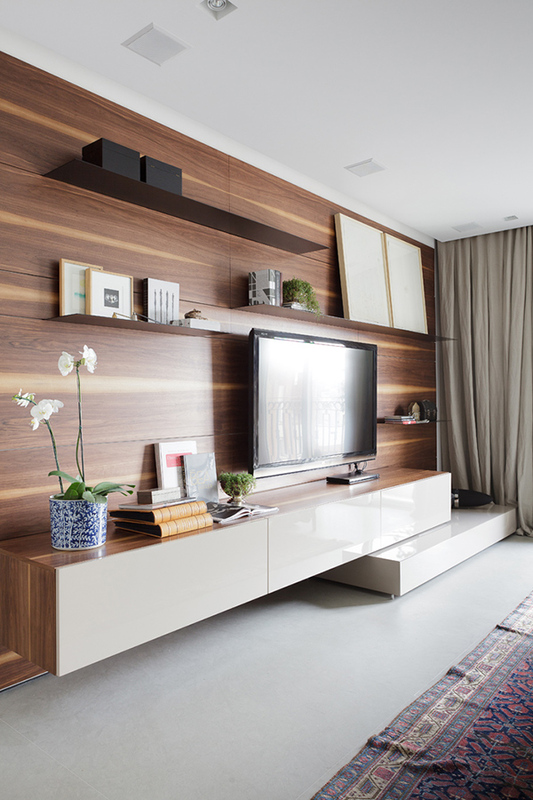 A wall system in the living room bears the television and other displays. 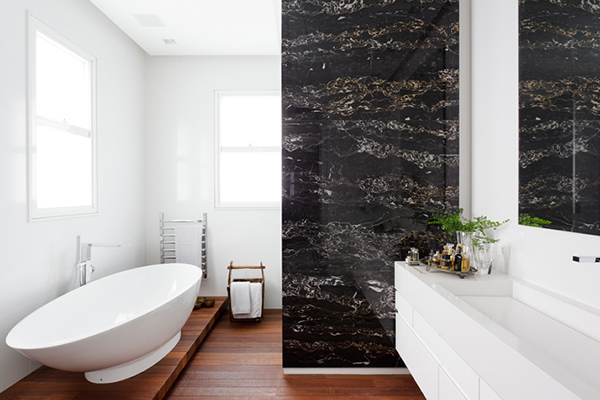 And this is the bathroom with wooden flooring and a creative wall partition. The apartment has a unique eclectic mix of decors from “playful and feminine to slick masculine chic”. But it never failed to ensure that function of every space. 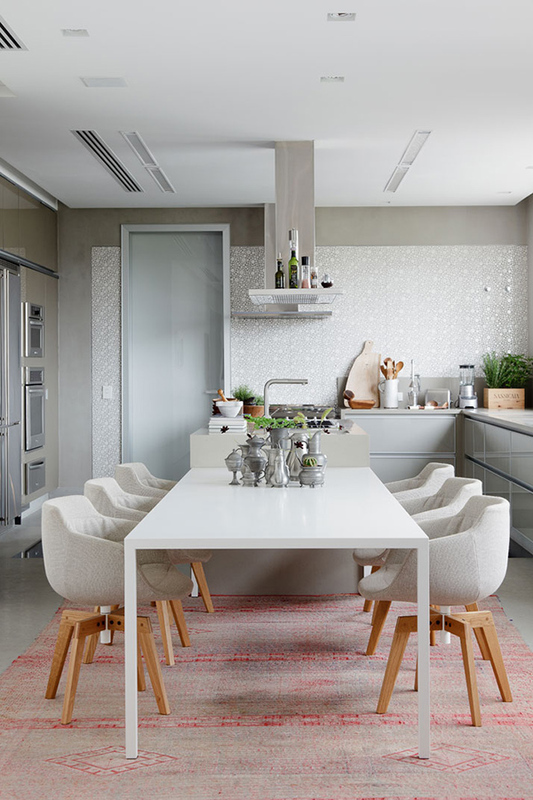 What Consuelo Jorge Arquitetos did to this apartment is indeed amazing! Despite all the art collections exhibited here, it didn’t look intimidating. Rather, it still appeared inviting and cozy creating a comfortable home environment.